I’m always surprised when I discover just how many businesses don’t have goals configured in Google Analytics. You may be measuring your e-commerce business in analytics, but there are still a lot of other options available to measure engagement, as well as other conversion points, that have no relation to generating revenue. Due to the fact that this is a very common step omitted from the Google Analytics account information, I felt it important to offer some advice on just how beneficial goals can be in Google Analytics; how important it is to set them up, and the different types of goals that can be set up. When considering goal configuration in Google Analytics, this action would typically be introduced in the early stages of your analytic strategy. Your goals should reflect those determined KPI’s (Key Performance Indicators) which would be outlined in the strategy. They may also track successful site visits determined by the time spent on the site or the consumption of content, or they could represent engaged visits based on predetermined attributes. Goals are extremely useful for sites that are strongly focused on persuading the visitor to purchase a service or product, and for those sites without strong CTA’s (calls to action). With these goals you’ll now have the information you need to track how your visitors are “converting” and what precisely is driving these conversions. Google Analytics has recently included the new addition of industry templates within goal configuration; these are for you to use when selecting the industry best describing your business when configuring your account setup. Ensure that you don’t skip over this section. There’s an Industry Category section when setting up the property, and it lists quite a few different industries to select from – and the list continues to grow! 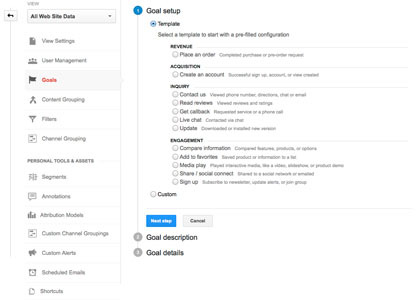 Within the Admin panel you’ll find Goal Configuration. The Goal section will be located underneath the Profile column, as Goals are specific to Profiles. Using Google Analytics you have the capability of creating twenty individual goals per profile. Personally, I have found that this is enough, however the simplest method of getting more goals, if required, would be to set up another profile for the same property. So now you’ll have a further twenty goals to use; make sure you can recall which goals you’ve set up in which profile so that you can pull metrics for them. 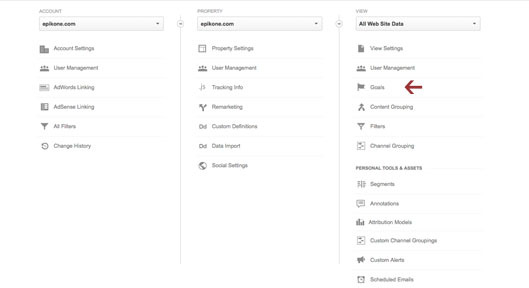 After you’ve selected “Create a Goal” you will note the “Template” option which only becomes available if you’ve chosen an industry when doing the property configuration, or the “Custom” option which will provide you with a list of the four goal types to select from: Destination, Duration, Pages/Screens per visit, and Event. If you’ve chosen a template option, it still falls into one of those goals as listed above, so you’re able to edit as required. In case you’re missing an important goal to set up, this template section will help to provide some extra ideas; plus move you through the process much quicker by selecting a specific goal type to use for a specific goal set up. Destination: Destination is specific to a destination URL. You’ll need to use a single page when setting up this goal, or if this page dynamically populates individual URL’s use a regex, or if you need to include some different URL’s in this one goal. A “thank you” page provides a perfect example for destination goals. Regardless of whether it’s a thank you page for signing up for a newsletter, or for a sale, this goal allows you to track visitors to those pages of your website. Duration: The goal “Duration” is exactly what it says. Duration is the amount of time a visitor spends on your website. This is a great goal if you’re running a blog and are interested in knowing that visitors are spending more than just a few minutes consuming your site’s content. In the setup of this goal you’ve got the option to complete Hours, Minutes and even Seconds fields. That’s how easy it is! Pages/Screens per visit: This goal is very straightforward. Basically you are configuring a goal which will determine how many pages per visit are required for the conversion to be triggered. I personally use this one quite a lot when setting up goals for “Engaged Users”. Work out how many pages you need each user to visit, then this goal can be set up to capture these users. Event: In my opinion this goal gives you the greatest amount of options. This particular goal type will not be an option for you if you don’t have any event tracking setup on your website. With the number of clicks and actions you can track with event tracking, this particular goal can become your go-to for measuring conversion with specific key actions or elements on your site. For example, newsletter submission buttons, video plays, add to wish-list clicks, add to cart clicks, social likes and/or shares, apply actions, etc.. Basically, there are endless options here, providing you’ve got the event tracking in place in order to capture this activity! You simply complete the event parameters as directed, and there it is – your goal is configured! And before completing setup the final step is to verify that the goal has been configured correctly. This process of verification will pull the percentage of visitors that would have converted based on the last week. This will provide an indicator that there’s no error when a percentage is returned. If it returns 0% then you’ll know there’s an error, unless of course event tracking has only just been implemented. Measure Goals Once You’ve Set Them Up! When measuring conversion rates and goal completions, here are a couple of key places you’ll need to be aware of. You’ll notice a section called “Goals” within the Conversion drop-down. All reports contained within this section are related to the goals you’ve configured in the back end. The perfect starting place is the Overview report, which provides all the metrics you require on conversion rate, number of completions, what sources drove the most goal completions, and so on. The goal drop-down can also be used to drill into a specific goal, or it can be left as the standard “All Goals” reporting. Don’t forget the Explorer section within most of the reports. When looking at reporting data throughout Google Analytics, the explorer section is towards the top of the page, and this will list your goal sets. You can choose which goal set you need to look at when measuring the conversion rate for different dimension sets across the interface of Google Analytics. It is here that I measure conversion and goal completions the most. And again; this is another important benefit of goal setting. For example, this is very useful if you need information of how different sources of traffic are converting and engaging on your website. The pros of setting up goals in Google Analytics definitely outweigh the cons. It certainly does take a little more work and planning on the account configuration side of things, but the pay-off in the long run will be very rewarding. This new insight that you’ll have will provide so much more data for analyzing, and to make actionable recommendations from. So now start setting up those goals!